AMD will soon be celebrating 50 years since its formal incorporation, and to celebrate this fact it appears there will be a 50th Anniversary Edition of the Ryzen 7 2700X processor. It’s not known if the special edition of the CPU will differ from the Pinnacle Ridge chip that was originally released in April of last year. Advanced Micro Devices was officially founded on May 1, 1969, which means the company will soon be celebrating 50 years of business. It’s likely the chipmaker has some plans for this special anniversary, and one of those plans appears to be releasing a special edition of the Zen+ CPU Ryzen 7 2700X. 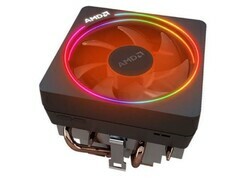 A listing for the special edition of the Ryzen 7 2700X has it priced at US$340.95, which might seem quite steep but the placeholder for the item does mention inclusion of an AMD Wraith Prism Cooler. A quick glance at Newegg shows that this CPU cooler can cost US$68.95, so the price for the 50th Anniversary Edition Ryzen 7 2700X doesn’t seem so hefty after all. Specifications for the 50th Anniversary Edition Ryzen 7 2700X with Wraith Prism Cooler haven’t been published yet, so it’s not known if it will differ from the regular version of the CPU. But with the RGB programmable LED on the Wraith Prism Cooler, at least you can add a light show to join in with AMD’s upcoming birthday celebrations.